A holiday that’s all about eating great food with friends and family is something to truly get excited about in my book. Thanksgiving is the best. The only downside? It’s just one day. Hence FRIENDSgiving. Thanksgiving will always be for getting together with family both near and far and cooking up grandma’s favorite recipes. Friendsgiving is about celebrating with your neighbors and your buds. It’s about playing around with the flavors of Thanksgiving and having fun in the kitchen. It’s about enjoying a glass of wine and watching football. When we host Friendsgiving, I like to incorporate some traditional flavors like turkey and pumpkin pie, but with a twist. 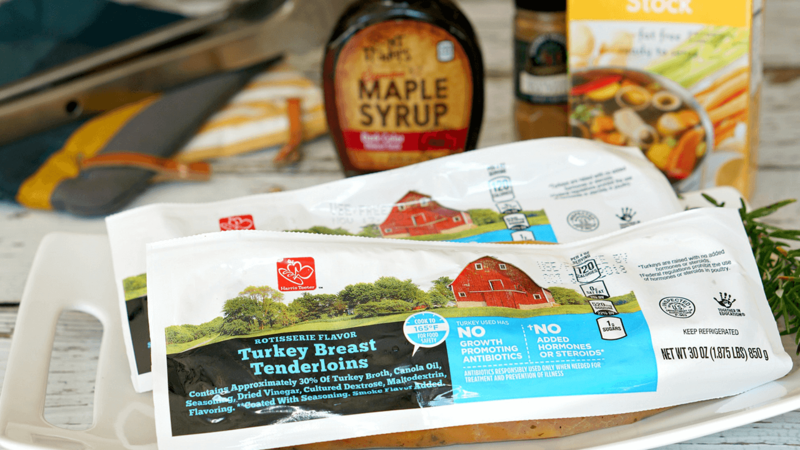 For this Friendsgiving menu, we’re taking turkey tenderloins and grilling them. Not only does this give the guys an excuse to man the grill with a beer in hand, but it also frees up precious oven space. Double win! 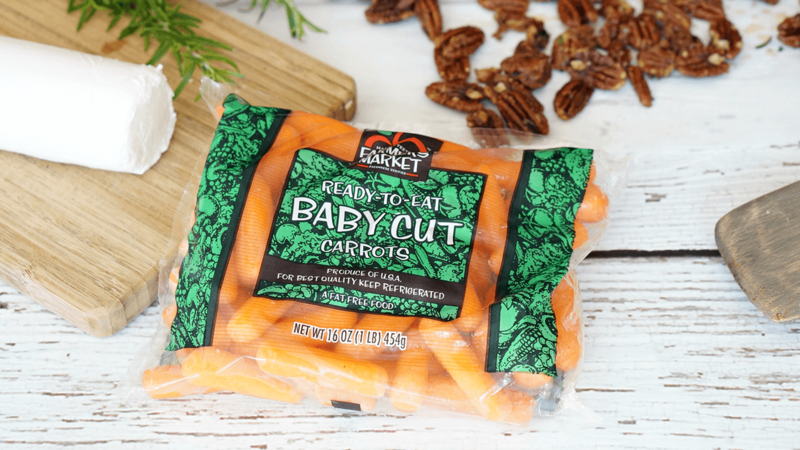 Our sides Roasted Carrots with Goat Cheese and Candied Pecans, Classic Green Bean Casserole, and Hasselback Red Potatoes with Herbed Butter are all easy to execute. These can each be made a few hours before the main event and placed in the oven as dinner nears. The grand finale for our Friendsgiving menu is a show-stopper. 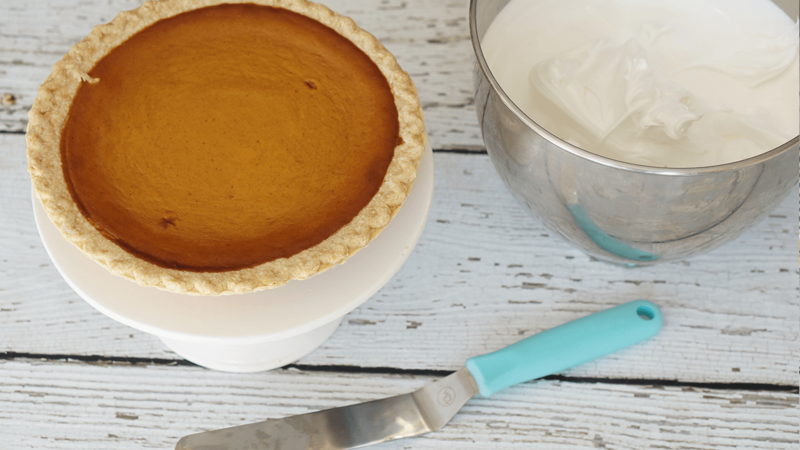 Simply take a prepared Harris Teeter Pumpkin Pie and dollop on spoonfuls of meringue. It looks elegant, tastes delicious, and no one will know it was store bought. Cheers to a fabulous holiday season! 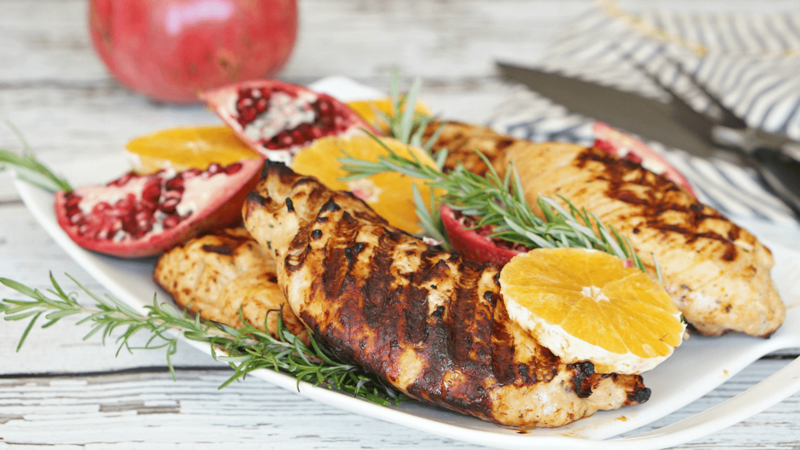 Cooking the turkey tenderloins on the grill frees up precious oven-space for your side dishes! Preheat your grill on high. Coat the grill with cooking spray, and place the tenderloins on the grill rack. Cook for 6-7 minutes on one side - don’t flip until you have nice grill marks. Flip, and continue cooking for another 6-7 minutes or until nicely charred and cooked through. Remove to a platter and allow to rest 10 minutes prior to slicing. Meanwhile, melt butter in a medium saucepan. Add the cornstarch and whisk constantly until smooth. Slowly add the stock, and continue to whisk until blended. Pour in the maple syrup and add the Chinese Five Spice seasoning, rosemary, salt and pepper. Stir constantly until the gravy comes to a slow simmer and thickens, about five minutes. 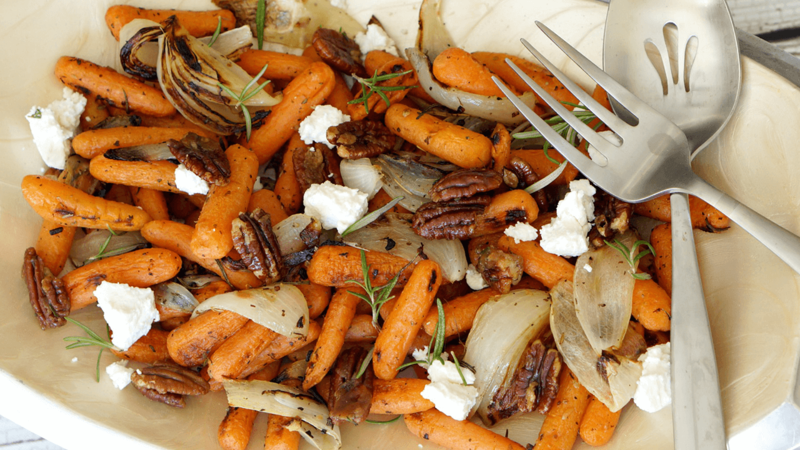 Whatever you do - don’t skip the easy step of making the candied pecans when preparing this roasted carrots side dish. They are divine! 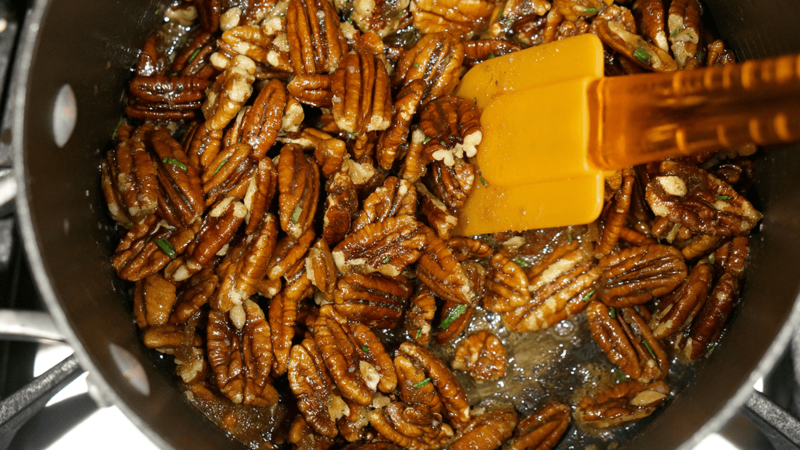 For the candied pecans: In a large saucepan, melt butter over medium heat. Add pecans and stir to coat. Add in the brown sugar, rosemary and salt. Continue cooking until caramelized, about 5-6 minutes. Pour mixture out onto parchment paper and allow to cool completely before storing. For the carrots: Preheat the oven to 450°F. Add carrots and sliced onion to a baking sheet. Drizzle with olive oil and sprinkle salt, pepper and fresh rosemary. Roast 20-25 minutes, shaking the pan occasionally. Remove from the oven once vegetables are tender and golden. Transfer the vegetables to a platter and garnish with crumbled goat cheese and candied pecans. Serve warm. 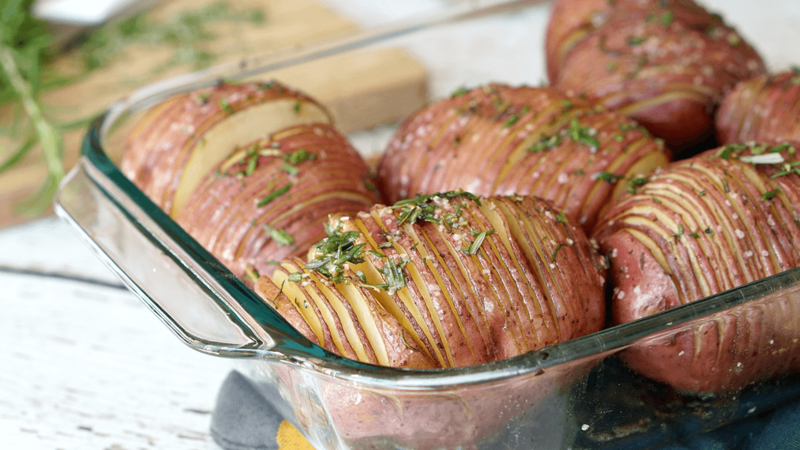 Slicing the potatoes but still keeping them intact allows for a crispy exterior with the creaminess and flavor of a baked potato! Preheat the oven to 400°F. 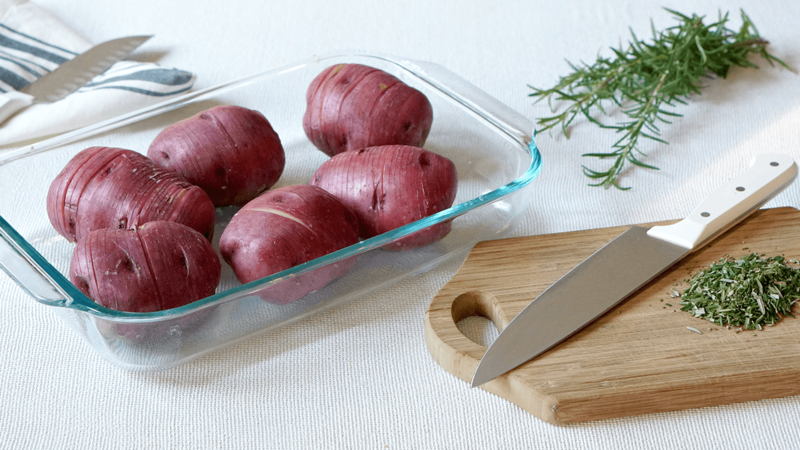 Thinly slice the red potatoes in ¼ inch thick slices, but only go ¾ of the way through the potatoes. Melt butter and add in oil and spices. Stir well, then brush on top of the potatoes and in between the potato slices. Bake for 45 minutes to 1 hour, or until fork tender and crispy on the outside. 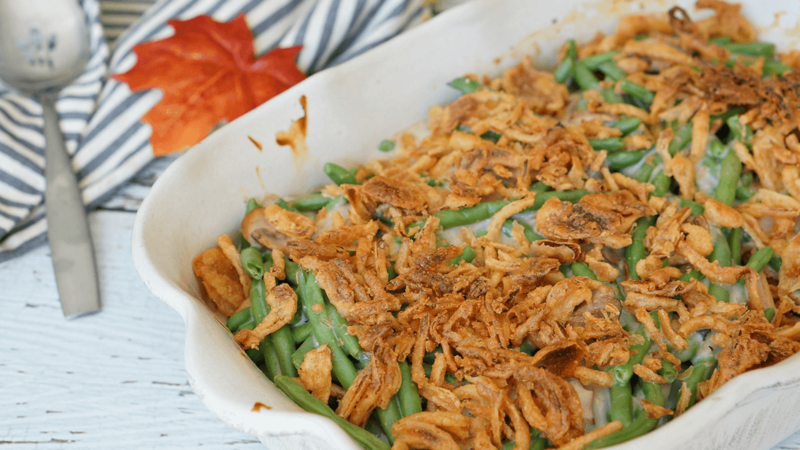 Thanksgiving isn’t complete without a Classic Green Bean Casserole. We’ve added sauteed mushrooms to the mix, but if you’re a purist, feel free to omit them! Preheat the oven to 350°F. Grease a 9x13 baking dish. Coat a small skillet with cooking spray and warm over medium-high heat. Add sliced mushrooms in an even layer. Cook for 3 minutes without stirring, then flip. Allow to continue cooking until golden on all sides. Remove from heat. In a large mixing bowl, whisk together soup, milk and soy sauce until smooth. 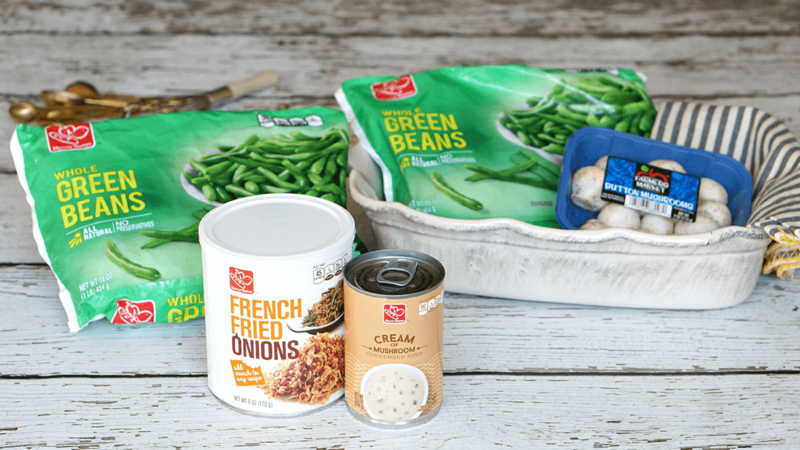 Add mushrooms and green beans and stir until coated. Pour half of mixture into prepared dish. Sprinkle with half of the french fried onions. Pour remaining green beans on top, and follow with a spinkling of the remaining onions. Bake for 40-45 minutes, or until golden and bubbly. Remove from the oven and serve warm. What’s better than pumpkin pie? 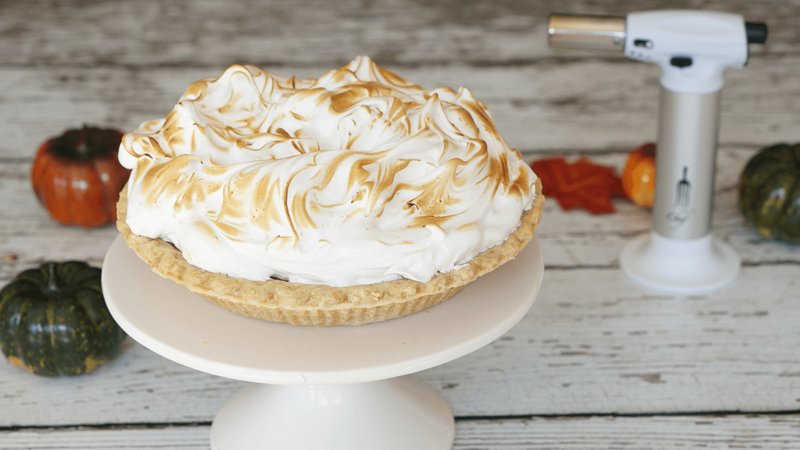 Pumpkin pie with meringue! It’s easier than you think! Combine granulated sugar and egg whites in the heatproof bowl of a stand mixer. Set the bowl over a pan of simmering water. Whisk until sugar dissolves, about three minutes. Transfer bowl the stand mixer base and whisk on medium speed for three minutes. Raise speed to high and continue whisking for an additional six minutes, or until peaks are stiff and glossy. Dollop meringue onto pie and spread using a swirling motion. Hold the cooking torch about 3-4 inches from the top of the meringue and move the flame back and forth until meringue starts to brown. Enjoy immediately!